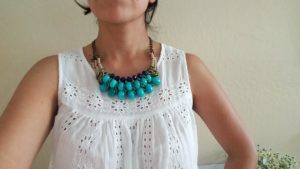 This post is a little bit on how to wear a bib statement necklace and features one of the jewelry items listed on my etsy boutique. 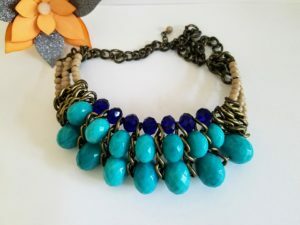 If you’re looking to spice up your look, this beautiful turquoise blue bib necklace will be striking on your wardrobe. This one is available at my etsy boutique at an excellent value. Plus, you get to feel good about being kind to the environment because this product is handmade and not mass produced. With bib statement necklaces you’ll want to keep your other accessories minimal (especially earrings or on your hair) because this necklace is meant to be the highlight of what you’re wearing. Since the bib necklace is making a statement, you don’t want to “overcrowd” or “clutter” your look. Be careful that your look doesn’t look overly busy. The whole point of your bib necklace is making that bold statement. You don’t really need much else on your top portion. Bib statement necklaces look best with simple necklines. This vintage bib statement necklace for women that I’m featuring would look fantastic with a strapless top, like an off the shoulder blouse. Though wearing it with a solid color is easiest to style, a patterned outfit is possible, too. It just may take a little more effort. 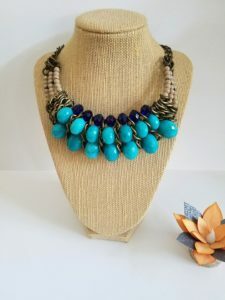 The most important thing about bib statement necklaces is to let them do most of the work on your outfit so that you can have fun effortlessly looking good! Enter your email address & receive new posts by email! 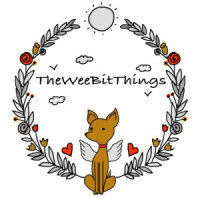 TheWeeBitThings, it's the little things in life!